Torn Boutique, 206 E. Brick St., Ozark, 417-827-5380, tornboutique.com. 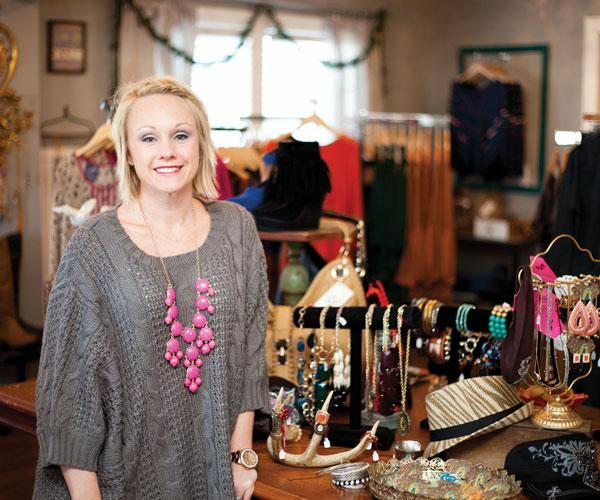 Open Tues.–Fri., 10:30 a.m.–5:30 p.m., Sat., 10:30 a.m.–4 p.m.
Carissa Greenlee’s first taste of the retail business happened during high school when she got a job at Norenes Shoe Store. Greenlee continued working there while she studied at Missouri State University, and after graduation, she worked in the mortgage industry and taught pre-schoolers before becoming a stay-at-home mom. 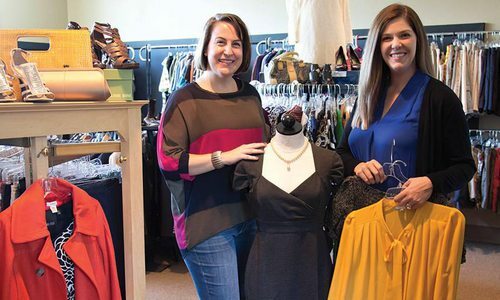 But once her daughters got a little older, Greenlee went after something she has always wanted—she decided to start her own business. Greenlee opened Torn Boutique in August 2012. Torn Boutique sits just north of the Ozark town square on Brick Street. The store is tucked inside a cute little white house with a teal door that jumps out to passers-by on the otherwise ordinary city street. And the inside is equally charming. Wood floors pair with fresh paint and new fixtures to make the 1940s-era home, which underwent a facelift five years ago, the perfect backdrop for displaying stylish women’s clothes and accessories. Two large rooms are filled with clothing racks displaying the latest in women’s fashions, and a third room includes two large dressing rooms brought to life with bright yellow-and-white chevron curtains. The home’s 70-plus-year-old architecture pairs with modern patterns and accessories to give the store a vintage-meets-modern charm, making it an eye-pleasing place to shop for a new outfit. Torn Boutique sells women’s clothing, handbags, shoes and other accessories, all items found by Greenlee herself at market in Dallas. And she has an eye for finding fashionable items that are hard to come by. But rather than always trying to find the latest and hottest accessory, Greenlee goes against the crowd. “I try to get things I haven’t seen anywhere else,” she says. But her picks are always fashionable and one of only a handful that can be found locally. “Usually, I only get six of each item,” Greenlee says. Luckily for Torn Boutique’s Facebook fans, frequent shoppers get a chance to see the goods online as soon as they arrive. “A lot of times, people will message me and ask me to hold something for them,” Greenlee says. And she’s happy to do so. In fact, fans can actually even purchase goods via Facebook. “I charge $6 to ship anywhere in the country,” Greenlee says. The store specializes in one-of-a-kind tops, dresses, colored denim and a plethora of scarves and jewelry, and prices starting as low as $6 for accessories. “Clothes are anywhere from about $25 to $100,” Greenlee says. There are a variety of big-time brand names up for grabs here, including Big Star jeans, MEK denim, Angie and Big Buddha handbags. You’ll find everything you need to build a great outfit. Every time you walk into a boutique, you hope to find clothing you’ve never seen anywhere else. That’s what happened when I visited Torn Boutique. As I moved from rack to rack, I spotted a dress and a sweater I wanted. I know I’ll be back, and next time, I’m going mid-week for Onesie Wednesday. That’s when Greenlee puts anything the store has only one of left on a rack and marks it down 30 percent for one day only.